The past few weeks have been hard on your wallet, waistline and skin. I’m heading into recovery mode and there are things I have to do to get myself back in order. I have dry scaly patches AND I’m breaking out. There’s nothing like a great Skin Detox so we’re fresh faced in the new year. It’s simple, easy, and most of all, it will make us feel better after all the holiday goodies. I can’t stress how drinking enough water is the first step in any good skin regimen. My esthetician tells me there are debates all over the internet about how much water you should be drinking, but I’m a firm believer in getting in at least eight cups of H2O per day. However, when I feel and look my best? I’m dividing my weight in half and drinking that many ounces of water per day. So, if you weigh 120lbs, then you’d drink 60oz. Ayurveda, the ancient healing practice of India, also has some great ideas for getting your system moving. They suggest you get up in the morning and first thing drink a cup of warm water with lemon. If you’re not drinking enough water, this is a great way to help get things going. 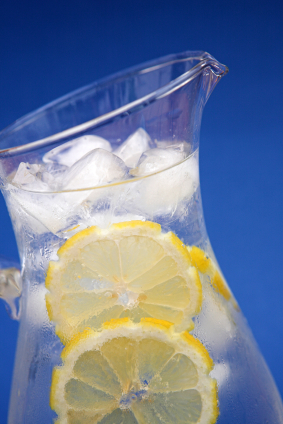 The lemon has acidic and antibacterial properties. This not only helps discourage yeast proliferation, but also aids regularity. Crucial when keeping the digestive system moving and free of toxin build-up. Go makeup free. I know how hard it is, but on my days at home, I go without makeup as often as possible. If I’m having a day with video conferences, I’ll just wear mascara and lipstick a lot of times. It makes me look pulled together, and I’m still giving my skin a break. Feed your skin. Not with serums and moisturizers. Feed it from the inside with the food you’re eating. Dark leafy greens, berries, melon and salmon all add up to help create gleaming skin. I try to eat from each color in my daily diet. As long as I’m doing that, my skin looks better, I feel better and I know I’m doing something good for body. Avoid sugar and processed foods. Not all sugars are bad, but processed white sugars aren’t good for you skin. Period. According to a study in the British Journal of Dermatology, we can put part of the blame on aging from a process called glycation. Glycation occurs when sugar, not just refined sugar, are eaten and glucose hits your bloodstream. When these little molecules are floating throughout your bloodstream, they are like little burrs, but instead of latching onto your pants, they are latching on to the proteins in the blood and then form a new molecule called advanced glycation end products or AGE’s. What does that mean in layman’s terms? The more sugar we eat, the more AGE’s we produce. I, for one, am kicking the dust bunnies in my house with disgust. I want firm, elastic skin and if I eat sugars, these little molecules wreak havoc on my skin. I want strong, healthy proteins, namely collagen and elastin. Smoking is another skin killer. If you do smoke, try to quit. It’s hard and will make your family and friends hate you for a few weeks. Chemicals in the cigarettes do nasty things, like break down the collagen in your skin, causing more rapid sagging and wrinkling. It also causes you to develop smokers lips — little fine lines all around your mouth. When I see young girls smoking, I want to grab my soapbox and lay down the healthy skin law. Finally? Sunscreen. Lots and lots of sunscreen. I wear an SPF everyday of the year: 15 in the winter, a minimum of 30 in the summer. If I’m on the beach or ski slopes, I go for 50 and reapply constantly. We have to have a certain amount of sunlight (15 minutes) daily to help boost our vitamin D levels, however any more and we’re damaging our skin. I see photos of Diane Keaton wearing hats and gloves. Sure, it’s part of her style and charm, but let me tell you what else it’s doing? Saving her skin. I’m vote we bring gloves back. It’s a feminine, retro look. People will think you’re eccentric. They won’t know you’re saving your hands (the first place to show signs of aging). So, what does all of this have to do with the price of tea in China, or saving time? It’s the little things. If we keep up with small things and adapt them into our routine, then we save time in the long run. We also save our skin and improve our health. That’s worth all the time in the world. Disclaimer: I’m not a doctor, nor do I play one on TV. The above is not to be constituted as medical advice, nor should it be taken as such. I’m a self-professed beauty junkie who’s coming to terms with aging and doing all I can to stop mother nature’s march across my face. Recently, I was sent bottles of Puristics Totally Ageless Anti-Aging Skin Care to try out. As as woman of a certain age, I realize there are things that require certain attention, my vanity being one of them. Yet it was the tree-hugger in me that was more intrigued than the almost 40 year old woman. I shouldn’t have to cover myself in potentially harmful chemicals as part of my daily personal care routine. Every day, we’re exposed to chemicals, pollutants, and other substances that can cause us harm—immediate or longer term. While all products can’t eliminate all risks, we as consumers can make choices that help to reduce our exposure. Puristic’s is free of scary chemicals and has no known irritants. I love that it’s naturally preserved and fragrance free. Even better? No parabens, phthalates or sulfates. Take a good look at the ingredients listed on many of the personal care products currently available. If it’s on the label, it’s in the product, and could be seeping into your skin. Check out product ingredient ratings at Skin Deep, the online cosmetics safety database created by the Environmental Working Group in partnership with the Campaign for Safe Cosmetics. That’s why I was thrilled to try Puristics. The products are recommended for all skin types, including sensitive skin. Needless to say, I was thrilled. There is really no scent to the products. I tried the Night Recovery Cream, Advanced Skin Rejuvenating Lotion and Revitalizing Eye Cream for two months. My skin has never looked better. I haven’t had any of the pesky breakouts I’ve become accustomed to appearing on a monthly basis (the teen years were good to me). There was no irritation, no redness and my fine lines started fading. The Night Recovery Cream is great for that little extra moisture you need after a long day. It wasn’t too heavy and made my face feel amazing. The Revitalizing Eye Cream was thicker than I am used to, but it still works really well. A little goes a long way. Puristics is being added to my regular cosmetic routine. Something I don’t say often, but I like not having to worry about what I’m putting on my face and into my body. It’s a breath of fresh, unscented air. North Carolina has been experiencing some of the coldest temps in years. Needless to say, my “normal” skin has gone haywire! I am dry, itchy, flaky and am afraid that if I were in the right company they would want to skin me for handbags and shoes! I did what any savvy gal would do and set out to research my options. I learned a lot more than I thought I would and have seen the improvements first hand. First things first: hydrate. Plain and simple, cut down on the caffeine and drink more water. Add healthy oils and fats to your diet as well. Extra-virgin olive oil or grapeseed oil and a healthy grind of fresh black pepper on any vegetable helps lubricate your skin from the inside out. I like to add avocado to my salads. Avocado, endive, a few walnuts, grapeseed oil and a squeeze of lemon is sublime. Turn down the temperature. Everywhere. In the shower, in your house, the office and the car. Try to keep it comfortable, but not stifling. Run a cool-mist humidifier to put moisture in the air, or put on a pot of water to simmer on the stove top. Don’t rub when drying off. Pat yourself dry. Then moisturize. I love Neutrogena Body Oil. Put a little on right after the shower. It’s light sesame scent is invigorating and fresh. For body lotions I generally stick with Aveeno, Aquaphor and Bliss. They have a variety of weights and the scents are neutral and don’t overwhelm or mask any perfume I wear. Faces need moisture. I will be quite honest, I used to spend a fortune at the cosmetics counter for moisturizers. Now? I use Aveeno and Neutrogena. For day I use Aveeno’s Positively Radiant moisturizer SPF 30. In the evening? Neutrogena for sensitive skin. To boost their moisturizing, I add Aveeno’s Active Naturals Positively Radiant Triple Boosting Serum. It’s lightweight and perfect under my moisturizer, giving me that extra kick that I need, without weighing me down. Dry hands and feet are just as hard to tackle. There are a variety of options out there as well! I love L’Occitane Shea Butter. I put it on my hands, feet and elbows. It smells divine. Some might think it is pricey, but it lasts for months. I have used about 3/4 of my tube and have had it for six months. I have also used Thera-Seal. It works very well and is also quite effective. Lotion up your hands and feet, slip them into cottong socks (or gloves for your hands) and sleep. If you want your feet to be silkier (and it takes a few weeks) pumice them gently once a week and moisturize, moisturize, moisturize. Lips are the hardest things to keep softened. Stop licking them and do what I do. Coat your pucker with extra virgin olive oil or grapeseed oil! It works like a charm. However, if you are looking for portability I love Burts Bees and Jurlique lips balms. They hydrate and protect. If you have chapped areas on your face and are adventurous, you can try what I did two weeks ago when I came down with a nasty cold. I rubbed the end of my nose and my lips with grapeseed oil and let it soak in. Then I put more on it. I then took out my Monistat Soothing Skin Care Protection Powder Gel and put a thin layer over them. The sore burning areas were protected by the dimethicone and healed up in just a few days! Of course, I kept repeating this every time I had to blow my nose. But no more irritation and I didn’t peel!! How is that for better living through chemistry? From time to time, I will rave about products and/or write about their pros and cons. I have not been paid nor compensated to provide said review. I am simply blogging about a product or service which I purchased and felt it worthwhile to blog about(positively or negatively). Should I receive a product to review, I will fully disclose said compensation.